Does everyone out there in this great big world of ours feel like they never have enough time? Or is that because I’m an over-committer. I’m loving this free MOOC (massive online course–or something like that) I’m taking, and I’ve been spending a lot of my free seconds online with the class. And so today, I’m going to share the second piece I wrote for the class, in which the mug I personified becomes an object of conflict and desire. The assignment was to have two people fight about the object. I chose to do this with the mug as simply an object, not personified as in the last assignment. 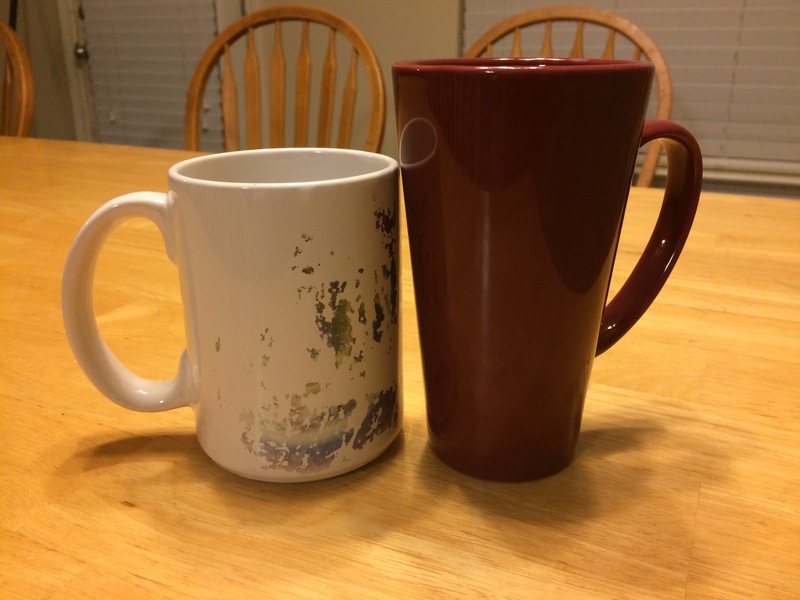 Oh, and if you’re a visual person here is Grandfather Mug and Red Tall Mug from the last story “Smithsonian Mug.” You may want to read that one before you read this, but they can stand alone too. Rob sat at the table and upon hearing my words shifted his eyes and turned his back, ever-so-slightly, away from me. I glanced at the pot of coffee, only two-thirds of the way full, instead of brimming over the top like normal. The rich aroma of brewed beans led me to Smithsonian mug. I slammed my fist on the table, and Smithsonian mug wobbled as black coffee spilt from its edges onto the white surface of the breakfast room table. “Fine, you can have your precious mug!” Rob said. He stomped toward me but didn’t see the Barbie doll on the floor until it was too late. It happened in slow motion. He tripped one leg held askance from his body as his arms flung out from his side, trying to catch his balance. Smithsonian mug flew through the air, coffee splashing the sage green walls of the kitchen. The deafening roar of the crash filled my ears as the precious mug shattered into small pieces across the tile floor. Smithsonian mug was no more. Some comments I received about this, is that my hand on the table was too startling and did not flow with the fight. I could see that, but anyone who knows me knows that I sometimes react more strongly than the situation calls for. My husband is also like this, and sometimes he’s non-nonchalant, like he is at the end of the story. Still, it gave me something to ponder in relationship to my story-telling skills, which is the point of the class after all. What do you think? If you’re a writer, leave me a comment-story about an object that’s being fought over! I’d love to read it. I thought the story was good. I don’t have an actual object that I’ve fought over with anyone. I suppose I could make up one, being that I’m a writer, and all. Thanks! Rob and I don’t fight over the mug either. He’s not particular about which one he drinks out of. Only I am. But the fight mimicked several of our fights in the past. Was fun to write!